Take a cooking class in Antigua and learn how to prepare some of Guatemala’s favorite dishes. Taste the unique flavors of Guatemalan cuisine as you create your own meal and dessert. Learn about the cultural influences of Guatemalan food from your expert chef, who will be there to offer helpful tips along the way. After your meal, bring home printed recipes of the food you prepared so you can continue making delicious Guatemalan dishes at home! Experience Guatemalan cuisine at a cooking class in Antigua! Taste the unique flavors of Guatemalan foods and learn about the interesting mixture of traditional Spanish and local Mayan influences on the country’s cuisine. 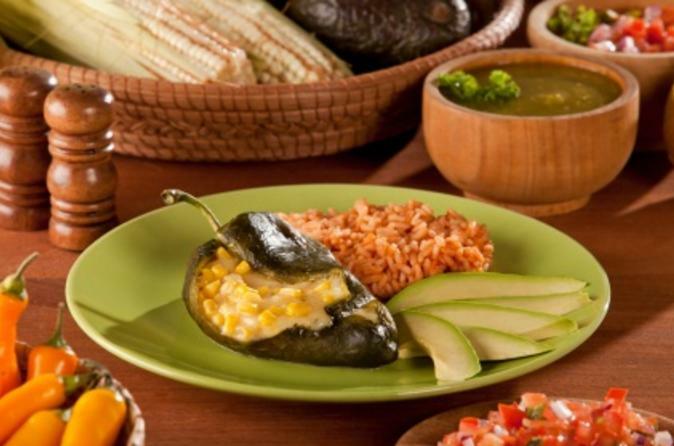 Guatemalan favorites include various types of tamales and chiles rellenos. After pickup from your Guatemala City hotel, head to your Guatemalan cooking class in Antigua. After a brief kitchen safety overview, your expert chef will start by teaching you about the Spanish and Mayan cultural influences on Guatemalan flavors. Learn about the staple ingredients and foods used by natives, including corn, peppers and beans. For your own meal, you’ll get to prepare one main dish, such as hilachas, two side dishes and one dessert, including camote en dulce or mole de plátanos. As you create your meal, the chef will be there to offer helpful guidance. Once you’re done, it’s time to enjoy your home-cooked lunch! After you savor your traditional Guatemalan meal and dessert, you’ll be transported back to your Guatemala City hotel.